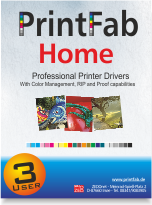 Use PrintFab on several computers e.g. Desktop, Notebook, Home-Server! You or persons in your household are using several computers? For a small surcharge you can expand your PrintFab license to three computers. Cross platform for Windows, Linux and Mac OS X: The family license if valid for all three operating systems (the single user license is only for Windows). Please note: The family is valid for private use only on up to three computers of the same household.